A major rally by various white nationalist groups -- under the name "Unite the Right" -- had been planned for Charlottesville Saturday. The city is progressive and not at all a center of white nationalism. But various groups have made Charlottesville a target because the city plans to remove a statue of Robert E. Lee from a local park. The Ku Klux Klan and supporters rallied in the city in July , causing concern at the university, but Friday night's march was on campus and ended at the Rotunda, a hallowed space at the university. The sight of hundreds of white nationalists -- most of them white men -- with torches stunned many at the university, even as they were preparing for Saturday's rally. Skirmishes broke out near the Rotunda between the white nationalists and counterprotesters, including some students. Teresa A. Sullivan, president of the university, issued a statement  late Friday. "I am deeply saddened and disturbed by the hateful behavior displayed by torch-bearing protesters that marched on our grounds this evening. I strongly condemn the unprovoked assault on members of our community, including university personnel who were attempting to maintain order," she said. "Law enforcement continues to investigate the incident, and it is my hope that any individuals responsible for criminal acts are held accountable." 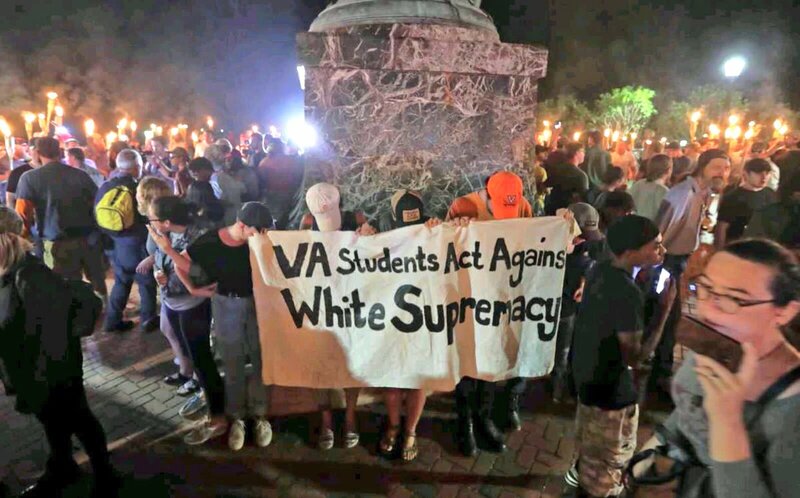 Mike Signer, the mayor of Charlottesville, issued this statement: "I have seen tonight the images of torches on the grounds of the University of Virginia. When I think of torches, I want to think of the Statue of Liberty. When I think of candlelight, I want to think of prayer vigils. Today, in 2017, we are instead seeing a cowardly parade of hatred, bigotry, racism and intolerance march down the lawns of the architect of our Bill of Rights. Everyone has a rig ht under the First Amendment to express their opinion peaceably, so here's mine: not only as the mayor of Charlottesville, but as a UVA faculty member and alumnus, I am beyond disgusted by this unsanctioned and despicable display of visual intimidation on a college campus." A university spokesman said Saturday that university police arrested one protester, who was charged with assault and disorderly conduct. Several injuries were reported, including one university police officer who was injured while making the arrest. The university permits demonstrations without permits on open spaces on campuses, and does not ban open flames during such events. University police declared the event an "unlawful assembly" only after "physical altercations" began to escalate at the event, the spokesman said. Some in Charlottesville tried (without success) to get courts to ban Saturday's rallies. Sullivan, in statements prior to Friday's march, condemned the ideas behind the planned rallies, but also defended the right of the white nationalists to express their views. "UVA is public in the most profound and meaningful sense of that word; we are committed to the public good, and we seek to recognize and represent the great diversity of the public in our commonwealth and in the country," said one earlier statement . "We believe that diversity is an essential element of excellence, and that intolerance and exclusion inhibit progress. We also support the First Amendment rights to free speech and assembly. These rights belong to the 'Unite the Right' activists who will express their beliefs, and to the many others who disagree with them." Sullivan also urged students to stay away from the protest (then expected to be off campus). "One may stand up for one’s beliefs without physical confrontation. I urge students and all UVA community members to avoid the Aug. 12 rally and avoid physical confrontation generally. There is a credible risk of violence at this event, and your safety is my foremost concern," she wrote. Sullivan added, "Moreover, to approach the rally and confront the activists would only satisfy their craving for spectacle. They believe that your counterprotest helps their cause. One advocate of the rally said, 'We should aim to draw the SJWs [social justice warriors] out in Charlottesville and create a massive polarizing spectacle in order to draw as huge a contrast as possible. They will reveal themselves to be violent, intolerant, opposed to free speech, the insane enforcers of political correctness, etc.' The organizers of the rally want confrontation; do not gratify their desire." The events in Charlottesville Saturday left a 32-year-old woman dead and 19 people injured. The white nationalist groups marched around the city, many with Confederate flags and some with Nazi symbols as well. They clashed with residents. In late morning, according to local press accounts , the city barred the rally from taking place, citing the escalating violence, but the worst was yet to come. In the afternoon, a car rammed into a group of the counterprotesters, killing one and injuring others. Observers said the crash appeared intentional. Charlottesville police later announced that James Alex Fields Jr., from Ohio, has "been charged with one count of second-degree murder, three counts of malicious wounding, and one count of hit-and-run attended failure to stop with injury." Also on Saturday, two state troopers who were in a helicopter as part of efforts to monitor events were killed  when their helicopter crashed. Those programs and other university academic and athletic events were called off after the city of Charlottesville and Albemarle County declared a local state of emergency. The university's medical center remains open. Among those who participated in the white supremacist rally was James Allsup, who is one of the leaders of the Washington State University College Republicans. His photo at events in Charlottesville was recognized. Many on social media are questioning his fitness to be a student leader at the university. @WSUPullman  why are permitting james allsup to continue at WSU. He is excrement filled w/hate & bigotry. He brings down your university. But he has been defending himself on social media, saying that the police caused the problems. He told KREM 2 News that he is a "paleoconservative" or a "right-wing libertarian," and said that the term "alt-right" is a slur. He also said he didn't approve of the swastikas at the event. To those calling him racist for attending, he said that "they are slandering me and [saying] that I'm racist without evidence because I talk about history and I talk about American politics."